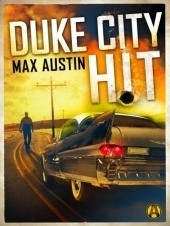 I read the first book Duke City Split, thinking this would pick up where that one left off, but no. this is a totally stand-alone book and I really enjoyed it. Vic Walters is a hit man and has been one for many years, he lives in Albuquerque New Mexico, he found out he has a temperament for it and he works out of a bail bonds office. He only works in a certain area that he knows and does not deviate from that. When things start to happen on a couple of hits that he cannot explain he sets a trap and finds out that he is a father. His knew found son wants to take up with him in his life and after everything checks he is deciding what to do. But all of a sudden he is starting to have more problems from a hit he did a while back and now with the help of his son he must find out who is causing him these problems. This was a very entertaining book with good characters and a fast paced story. I enjoyed this book very much. I got this book from net galley. I give this 4 Stars.